Monday, November 9 | Klepac & Co.
Tuesday, November 10 | Bexar Goods Co.
Today’s Makevember feature is Bexar Goods Co. BEXAR Goods Co. is the creative collaboration of a small team of craftsmen based in Bexar County, Texas, the heart of the Texas Hill Country, an area with a rich heritage in leather use for outdoor travel. While their roots are based in Central Texas, their vision and inspiration are drawn from cultures around the world. 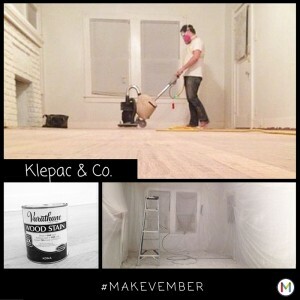 Today’s Makevember features VeryThat, the labor of love of Cristina M. Martinez. From tiles to mini loteria sets, VeryThat has you covered with all your necia needs including wares capturing spanish sayings as well as goods paying homage to Frida Kahlo and Selena. Her traveling tiendita is always on the go. Follow her at VeryThat, and see where you can find her next. Our Makevember featured maker is Manue Reynolds of PrettyKiku. We’ve already shared our love of Manue Reynolds japan-inspired goods. Her washi earrings won us over, but her shop, PrettyKiku, offers so much more. From funky bangles to cherry blossom ornaments, Pretty Kiku offers a sweet and simple style. The holidays are fast approaching, and our local craft markets have you covered. Monthly markets such as SoFlo Market and Goliad Market Days are great examples of what we have going on around the holidays. 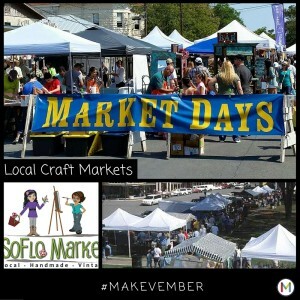 Starting with SoFlo Market, where you can find over 40 local artists and artisans selling their wares. Venture to Boerne Market Days located in the heart of the historical district on Main Plaza, where you’ll find a variety of bargains to be found such as jewelry, plants, art, handcrafts, collectibles, antiques, and more. Head of to Goliad Market Days for an open air market experience that combines an arts and crafts fair, farmers market and community festival. Spend Sunday at Brick Marketplace for an assortment of handmade items by local makers. The Marketplace offers rare finds, art, photography, vintage looks, oddities, people watching, and more. The Wolfson House Christmas Arts & Crafts Shows at First Baptist Church San Antonio is one of our favorite local craft shows. Makers specializing in everything from homemade sweets to handmade wares, this downtown arts & crafts show is a great example of our local varied #maker community. The arts & crafts show kicks off on Monday, November 16 through Friday, November 20 from 10AM-6PM and Saturday, November 21 from 10AM-3PM.